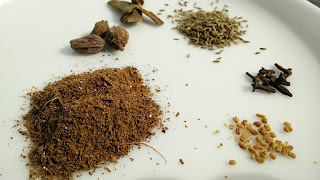 Dry roast all ingredients except cumin seeds and fenugreek seeds. Both these ingredients can be roasted separately. Allow the mixture to cool down and grind the mixture to fine powder. Store in cool, dry place in airtight container. Sprinkle this masala just before serving any vegetable.